For those researching ancestors in the Puslinch area, a good contact might be the Puslinch Historical Society. They have an archive room at the Puslinch Library in Aberfoyle. Be sure to check out their website for details as to when their archive room is open and what events they have coming up. They provide research assistance on a variety of topics including information on local families, villages and settlements, local veterans, lot histories, cemeteries, township papers and so much more. 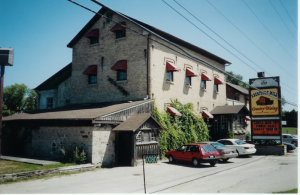 Thanks to the Puslinch Historical Society for providing us with the above photo of the old grist mill in Aberfoyle that has since been converted into a restaurant. 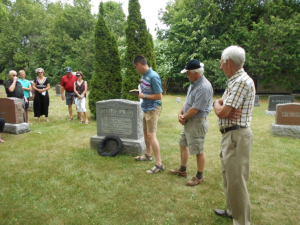 For several years the society has held Spirit Walks through one of the local cemeteries. You can read about the early settlers whose stories have been preserved in this way on the Puslinch Historical Society website. This photo above was provided by the society was taken during their 2016 Crieff Spirit Walk and shows the McDonald family marker.